Water leaks can easily become a major problem. In most cases, they start out small, and slowly progress into a disaster. Leaks that aren’t caught in time can cause structural damage to your home, not to mention foster mold growth within (and on) your walls. The trick to fixing leaks promptly lies in catching them before it they a chance to grow. There are many ways to detect a water leak. Some of these help you find one during the early stages, while others fall into the catastrophic category. Look for water stains on your ceiling. Water collecting above the ceiling will discolor it in a very visible way. Keep an eye out for water pooling around your toilet. This is a sign that the rubber ring underneath it has broken. Listen for a hissing sign inside your toilet tank. 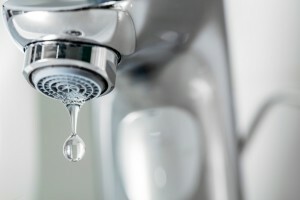 A drastic change in water pressure can be another sign that there’s a leak inside of your system. Mold begins to grow on the inside walls of your home. Small pools of water form in your basement directly underneath your water pipes. Turn off all of the water inside your home from the main shut-off valve, and then check your outside water meter. If it’s still running, then you have a leak inside of your home. Water forms under your hot water heater. This is a sign that the valve may be malfunctioning and leaking. Your faucet is dripping. Although this is something that is often overlooked, it can add to your water bill if it’s allowed to continue unabated. Your ceiling is caving in. This is the sign of a major leak! Water leaks can result in larger utility bills, construction costs and fees for mold removal. All of these are reasons why you need to check your home for leaks periodically and keep an eye out for odd pools of water.